The more the markets rally's the more bulls we have. The more the market drops the more bears we have. Its the way of the investing world and why the most money is always made when markets abruptly turn. I think we are close to a major market turn. There is a general lack of conviction in this market. The weekly Bull/Bear survey from the AAII is still surprising. According to the survey, bullish sentiment increased to 50.89% which is the second highest reading in two years. Just a few weeks ago when the Dow was below 10K and the SPX was hugging major support at 1040, the number of bulls was near 20%. They hated the market 7% ago yet they love it today. Its really amazing what market sentiment does to people's imagination. 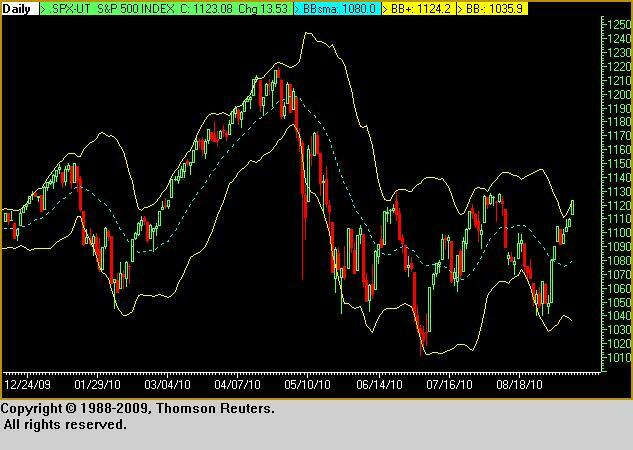 On August 26th when the SPX was between 1040-1050, the number of bulls was near the March 9, 2009 low. This is why I loved the market at the moment. To much fear. Today with the index above 1120, a full 7-8% higher, we have the most bulls in two years. not enough fear and too much greed. The number of bears has moved from 49% a few weeks ago to 24.3% today. This is huge! Gold keeps moving higher as the dollar drops. The Euro, Yen, & Aussie Dollar are all moving higher pressuring the USD. Back to gold for a moment. The SPX return for the year based on Gold is a negative 14%. That's all you need to know about FIAT currencies. The Chinese Yuan is higher again vs the dollar. Yesterday, the US filed with the WTO against China and their vast currency manipulation scheme. This sows the seeds for a trade war with China. 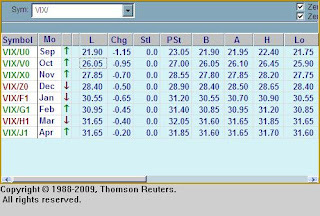 Another word of caution, the 1987 Crash followed Secretary Backer starting a trade war with Japan. I am just saying. India raised interest rates again. So we have the two biggest emerging market economies in tightening mode. i am just saying. Did I mention the European Sovereign Debt Crisis? To me there are always facts, figures, correlations, charts, and indicators that tell me a change in market direction is upon us. Today may or may not be that day. I err on the side that it is or we are very very close to a market top and an imminent turn to the downside is here. We all point to bull/bear figures, sky high correlations, fund flows, options implied volatility, and even the might VIX. Today the one thing that leads and drives equity market values is liquidity. I simply stated this a few weeks ago when the markets were below 10K. That liquidity was the most important factor driving the market and that the Fed will always supply via POMA and other open market operations ample liquidity to goose the market. We have seen M2 rise since late August. We have seen that Bernanke is all in in terms of helping out Wall Street. We have seen what POMA can do to goose equities. The market has so far been able to sidestep massive problems in European debt markets, a clearly overheated China construction market, wide spread speculation in the Indian Stock Market, lingering housing problems, and a pending double dip in the US Economy. Anyone who states that this economy is not sinking is just too busy drinking the Kool-Aid. When 2/3rd's of the US Economy is consumer spending, and its these very same consumers who are still trying to dig themselves out of a debt hole and desperately trying to just pay the mortgage, we can't point to an economic recovery. The recession or even depression for most Americans never ended. They still live in overvalued homes. They still have revolving debt to pay off. They are still looking for jobs. Even after the stock market has raced some 70% off the lows, jobs are no where to be seen. The US Economy is a credit economy backed by housing. Credit like the economy will only expand when people have a reasonable assumption of paying back their debts. With real job growth no where to be seen, many Americans have no confidence in spending let alone in Government. As I walk in this morning I see a massive disconnect in global equities to what is actually happening in the real world. The financial economy just like in 2007 is completely living a fairy tale. The Traders In Wonderland are ramping up equity prices all over the world. There reasons? Lets see. 1-China Industrial Production higher then expectations. 2-Resolution to Basel Banking Guidelines. For the life of me I can't figure it out. These two stories are reasons to sell the market hand over fist, but just like 2007 in the face of impending credit doom many were just closing their eyes and buying. Why? They just trusted the ECB and Fed to keep the Kool Aid running. Today its the same mentality. Buy Buy Buy until the Fed takes the punch bowl away. Well, in 2007, the Fed didn't take the punch bowl away. The expectations today just like they were in 2007 too aggressive and too disconnected from reality. The leverage in the system coupled with ludicrous expectations caused massive liquidations in stocks. Today one can say that the Fed has learned from their mistakes. That Wall Street has learned form their sordid ventures. That institutional and retail investors have learned. They are kidding themselves. Firstly, the Fed only knows how to print, Wall Street only knows predatory behavior, institutions have to be fully invested at all times, and that retail investors are sheep. This is all true except that retail investors have already been slaughtered. They are not in this market. 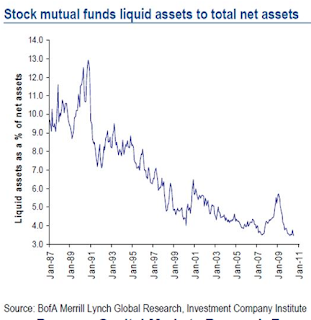 After the 2008 economic collapse and May 6t Flash Crash, trillions have flowed out of equity mutual funds. The stock market is a house of cards built on High Frequency Trading. We saw what the machines were all about on May 6th. The next correction we will have will be quick and devastating and we can point to faulty market structure not leverage for the prime culprit. You cant blame sheep when they have already been slaughtered. For today I am thinking that the markets will top out some time during the afternoon. I came across these charts that frankly scare me. Mutual funds are all in. The cash on the sidelines analogy is a giant myth. 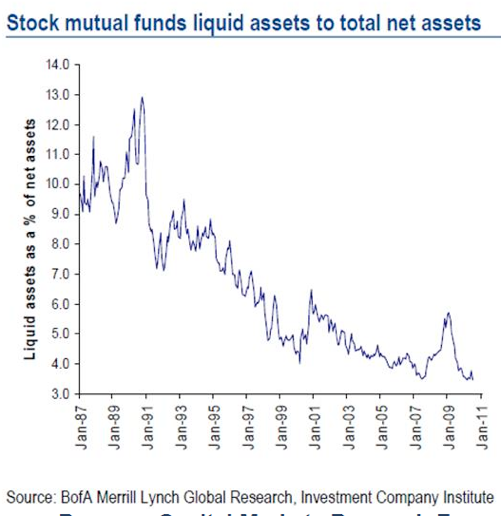 The % of liquid assets was 3.4% in July. I am thinking this figure is even mower today in September. This is the lowest % cash level and is near the levels that accompanied the 2007 equity market peak. 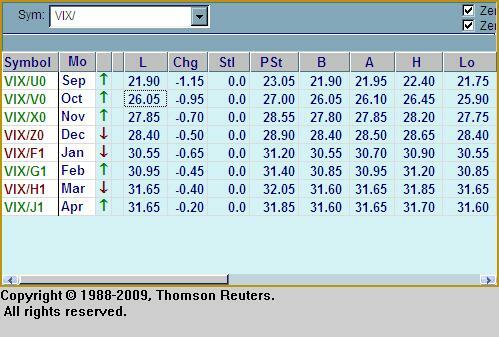 This is also tells me that equity mutual fund managers who are the most stupid of all investors are quite bullish. The last two times we witnessed cash levels near these levels were directly before the 1999 market implosion and the 2008 market debacle. You cant look at one indicator but this is one macro indicator is well worth noting. 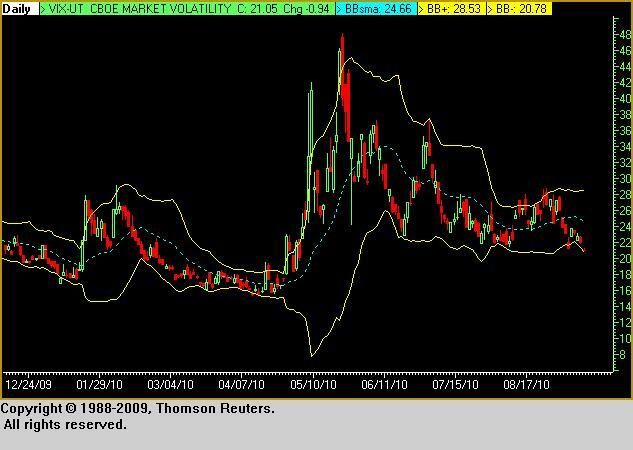 Volatility stripped out of the market but future volatility still elevated. 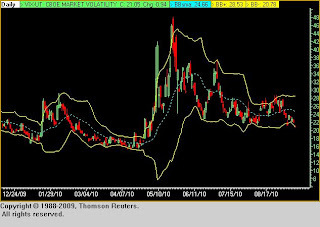 The time to buy the VIX or be long Volatility which is effectively short the market is when the VIX hugs or crossed the lower Bollinger Band. As you can see this has happened today. On other occasions this has conveyed a market drop. So to for the SPX 500. 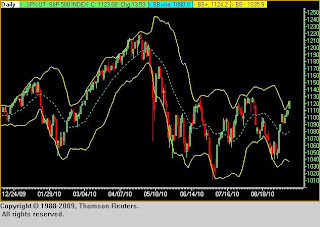 Sell the SPX when it it is hugging the upper Bollinger Band.